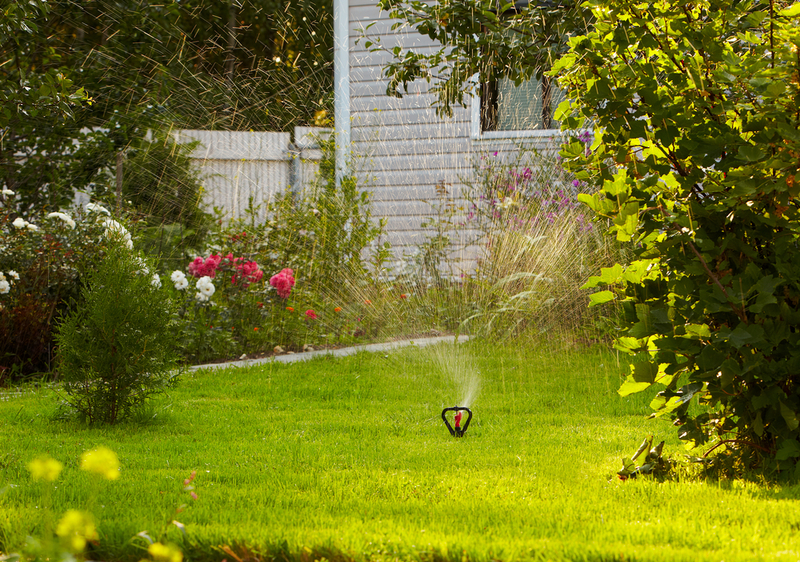 Garden hoses, nozzles and sprinklers can be a good start when irrigating larger areas. Try not to water during the hottest part of the day as a great deal of it can be lost to evaporation and runoff. Starting in the early morning will give plants ample time to take in water and allow the surface to dry before the heat of the day. This will help keep plants hydrated, yet minimize conducive conditions for the development for disease. It’s not written in stone, but it’s a fairly strong rule of thumb that lawns require one inch of moisture per week, while landscape plants require two inches per week. Again, those numbers are starting points. Soil conditions, sun exposure, and plant or turf variety can all influence weekly irrigation requirements. It’s best to take the time to research your plants and understand their water requirements. Even if you have irrigation, don’t be scared to pull out the garden hose and give “hot spots” an extra drink to help its survival effort. That being said, if you see wilting in your plants, it’s not always a sign of drought stress. It can often signal root rot. Using your finger to push into the soil at the base of the plant, you should feel some moisture, but not standing moisture. Taking the time to learn and understand the water requirements of your garden or landscape can save you time, money, and the heart ache of a dying plant. I cringe when I catch people soaking down the leaves of a plant. Plants are not going to utilize water from the leaf surface. Focusing your watering efforts on the root system will ensure the part of the plant that needs water most – the roots – have an available supply to use. Trees and shrubs are going to utilize more water than turfgrass, but what we don’t want to do is leave the root systems “drowning.” Pay attention to water water collects or pools as this can often lead to plant health issues later down the line. Mulch is an important component in moisture management. Understanding how much you need is even more important. A fresh 1-2″ layer in the spring and fall can help minimize the amount of water lost to evaporation. Be careful mulching around trees – use an extremely minimal amount. Aggressive tree roots can grow into the mulch and then will rely on it for survival. Remember, as mulch breaks down, it releases vital nutrients plants will use to survive and thrive – so keep it re-energized with a fresh layer every year!